It was last year when I introduced Bibibons Biscuit and Cereal in One to my baby who is now 21 months old. She was only six months old when she tasted this biscuit nibblers. Because she her milk teeth were few and too small during that time, I mash the biscuit with milk as an instant cereal so that she can easily eat. Now that my baby is already turning two years old this December, most of her milk teeth come out that she can bite and chew better. I still give her Bibibon’s Biscuit and Cereal in One and now she loves nibbling it. What is Bibibons Biscuit and Cereal in One? Bibibons is the first local baby biscuit and cereal-in-one especially formulated for babies who are starting to eat solid food. It has the taste and the texture which baby will definitely love. Instant cereal are for babies aged 6-8 months that can be served in soft cereal format by dissolving the biscuits in hot, warm water or milk then mash it. Finger food is recommended for infants once they reach the age of 9 months. Just what I’ve said in my review “Bibibons Biscuit Nibblers for babies 6-24 months“, my baby likes it the first time she tasted it. For adults, it is not so tasty which I really like for my baby because for me when you exposed the baby to too much ingredients and taste, it tends to influence their taste buds. That at an early age, I think they will be more picky with the foods and expect a lot more ingredients or taste with their foods. As for the texture, it is a lot more better compared to the popular local biscuit that we have because Bibibons is great for teething babies that they have to really exert an effort in biting and chewing it. The biscuit is not that hard just right and surely babies nibbling it will enjoy. 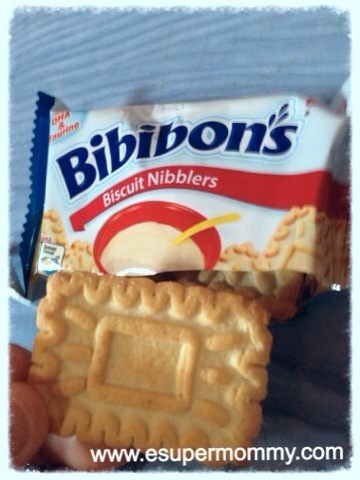 So, good job to Rebisco for making Bibibon’s Biscuit and Cereal in One with the right taste and texture. Health wise, it says in the box that Bibibons Biscuit nibblers supports a healthy immune system with Pantothenic acid and vitamin C, supports body development with vitamin A, Iron and Calcium, with Vitamin D, Vitamin E and Folic Acid and it has DHA and Taurine. It is actually not only enjoyed by my baby girl but her elder brother who is already five likes the taste of Bibibon’s Biscuit and Cereal in One. Filed Under: baby products Tagged With: Bibibon's Biscuit and Cereal in One Feeding Suggestion, Bibibons, Bibibons biscuit nibblers, What is Bibibon's Biscuit and Cereal in One?